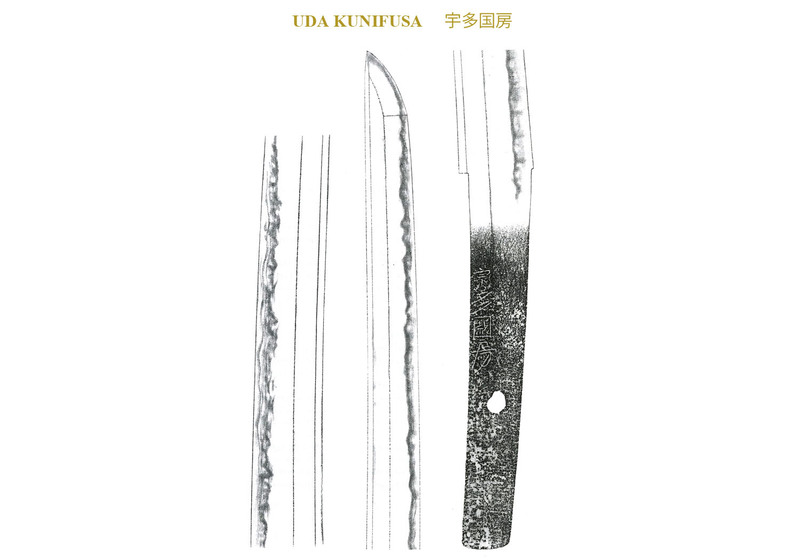 The founder of the Uda School (宇多) is considered to have been Kunimitsu (国光). He was originally from the Uda (宇多) district of Yamato Province. He worked around the Bunpo Era or 1317 at the end of the Kamakura Era. All of the succeeding smiths of this school used the kanji character “Kuni” (国) in their signatures. At some point he moved to Etchu Province so even though the Uda (宇多) School had its foundation in the Yamato tradition, it is considered to be one of the wakimono schools from this region together with such schools as he Fujishima (藤嶋) and Chiyozuru (千代鶴). Together these three schools are often referred to as the kita kuni mono (北国物). Since remaining works by Kunimitsu (国光) are non-existent, his students, Kunifusa (国房) and Kunimune (国宗), are generally thought to be the true founders of this school. Both of these smiths studied under Norishige (則重) of the Etchu Province and they were active around the Koan Era (1361). The works of these early Uda (宇多) smiths followed the style of the Yamato Den particularly in the areas of sugata and hamon. The Uda (宇多) smiths who were active prior to the Oei Era (1394) were few, while those active after that era were more numerous. Generally the quality of the workmanship of the Uda (宇多) smiths of the Muromachi Era is inferior to that of Kunimitsu (国光) and Shodai Kunimune (国宗). While the jitetsu of the early Uda (宇多) smiths is refined, well folded and beautiful, the works of the later Uda (宇多) smiths tends to be more likely to have signs of a few impurities. The nie is a bit coarse and the hikari is particularly strong. The nie grains tend to be separated and to twinkle like stars. 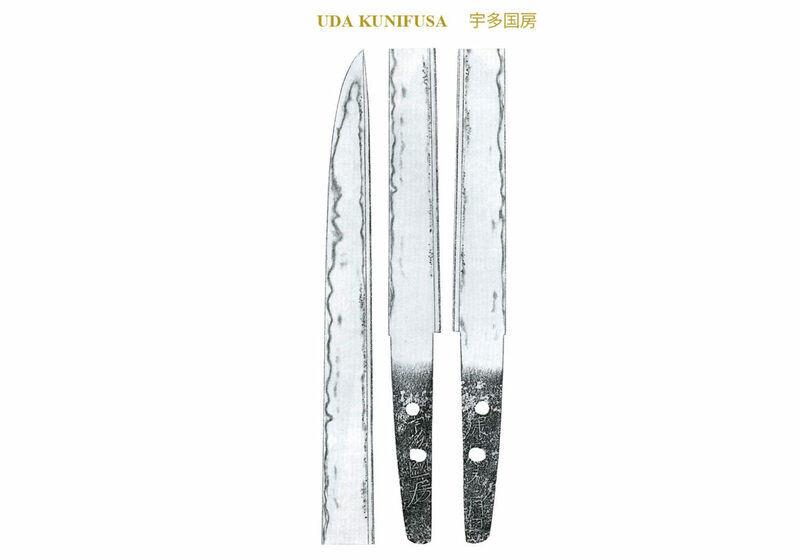 This is an important kantei point when looking at Uda (宇多) blades. Also, there are places in the yakiba where the nie is vigorous and places where there is only nioi. SUGATA: Early blades will show some Yamato characteristics. 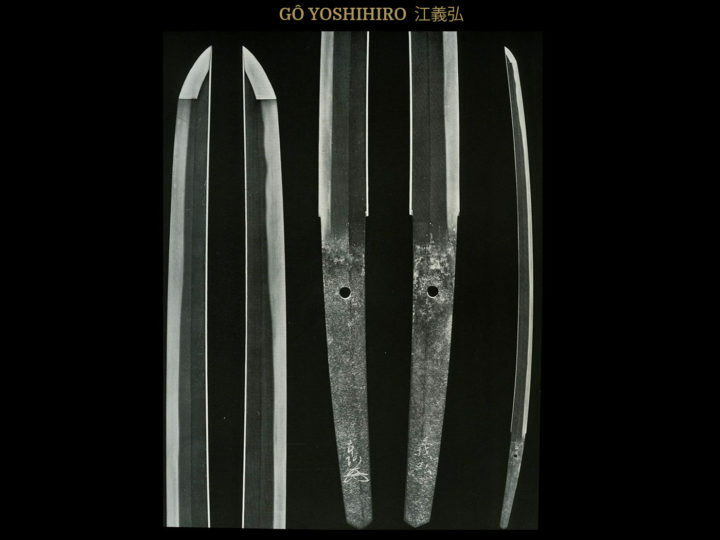 Later blades will be more typical of the Muromachi Era with a shallow sori tending towards saki sori. 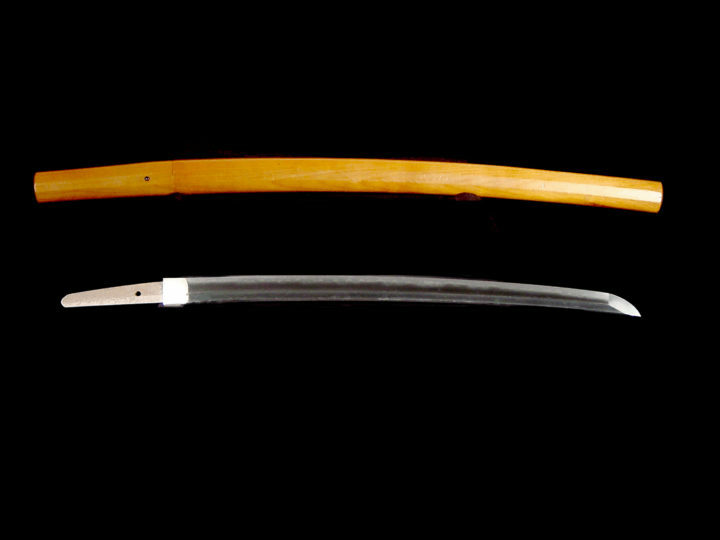 Generally, the katana will be shinogi-zukuri, iori mune with a fairly high shinogi. They made many tanto in a variety of shapes including hira-zukuri in normal length and sun nobi length, moroha- zukuri, and takenoko-zukuri. The kissaki will be a little longer than a normal chu-kissaki. JITETSU: After the beginning of the Muromachi Era the jitetsu can be coarse and rough with mokume hada and masame hada mixed together. The individual grain of the steel will stand out distinctly and there are a few with shirakke utsuri. Usually the utsuri to be seen will be tsukare utsuri. There will be areas of o-hada. HAMON: The hamon will with be of nie structure. Notare midare and gunome midare will be found and there will often be similarities to the Yamato Tegai and Yamato Shikkake schools. Like the Fujishima School, most hamon will be a combination of several schools including Bizen and Soshu. There will be abundant nie activities such as ashi, yo, nie hotsure, sunagashi, and kuchigaiba. The nie will be coarse and the hikari (reflective tendencies) will be strong. Occasionally a slight hitatsura temper will be found. BÔSHI: Ko-maru, hakikake, nie-kuzure, etc. A long kaeri will often be found. Sometimes it will continue into muneyaki. NAKAGO: The length of the nakago will be short with the tip made broad and in a rounded kurijiri or ha-agari kurijiri shape. The nakago of tanto tends to be a little longer than other tanto of this time. The yasurimei will generally be yoko or kiri. HORIMONO: Suken, bo-hi (single grooves), soe-hi, and futatsu-hi can occasionally be found.